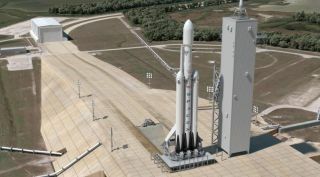 An illustration of a SpaceX Falcon Heavy at Launch Complex 39A at NASA's Kennedy Space Center. NATIONAL HARBOR, Maryland – SpaceX President Gwynne Shotwell on March 9 said the company expected to conduct 16 more launches this year, including an inaugural Falcon Heavy rocket in November, and would accelerate its launch rhythm in 2017. Hawthorne, California-based SpaceX has made lavish forecasts in the past and has come up short. But the company has now launched, twice, the Falcon 9 Upgrade rocket and has not announced any major enhancements for the coming months. A stable product line makes it easier to accelerate launch cadence. Shotwell's 2016 launch rate estimate was not surprising given her previous statements. But her conservative estimate of the savings to come when Falcon 9 first stages are recovered and reused was notable. Given that SpaceX has no intention, for now, of recovering the second stage, she said a launch with a previously used first stage could be priced 30 percent less than the current Falcon 9 rockets. SES of Luxembourg, SpaceX's biggest backer among the large commercial satellite fleet operators, has said it wants to be the first customer to fly with a reused stage. But SES Chief Executive Karim Michel Sabbagh said here March 8 that SES wanted a 50 percent price cut, to around $30 million, in return for pioneering the reusable version. Shotwell said it was too early to set precise prices for a reused Falcon 9, but that if the fuel on the first stage costs $1 million or less, and a reused first stage could be prepared for reflight for $3 million or so, a price reduction of 30 percent – to around $40 million – should be possible. Shotwell's appearance here punctuated the changed atmosphere between the U.S. Air Force and SpaceX. A year ago, the company was just coming off a legal battle with the Air Force centered on the U.S. military's use of the United Launch Alliance Atlas 5 rocket, and on how Air Force rocket-purchase decisions are made. Since then, the two parties have reached an understanding and SpaceX is now competing for an Air Force contract whose award Shotwell said should be announced in the coming weeks. She said it would be the first contract that has been fully competed under the Evolved Expendable Launch Vehicle (EELV) procurement program since 2006. "It's great," she said. "The world is a new place. We have a great partnership with the U.S. Air Force." The first use of the Falcon 9 Upgrade rocket occurred in November, for the launch into low Earth orbit of 11 small communications satellites for Orbcomm Inc. of Rochelle Park, New Jersy. SpaceX was able to return the first stage to a landing zone near the launch pad. Shotwell said she visited the stage and was impressed with how little wear and tear it showed. "[Y]ou pull off the cover and that wire harness is pristine," she said. "The metal is still shiny. You pull off the thermal protection system that we have near the engine, and that engine is beautiful. It is perfectly clean. "It was extraordinary how great it looked. In fact we didn't refurbish it at all. We inspected it and then three days later we put it on the test stand and fired it again. The goal is not to design a vehicle that needs refurbishing. It is to design a vehicle that we can land, move back to the launch pad, and launch again. Hopefully our customers will get comfortable flying the third or fourth time." The December launch of the inaugural Falcon 9 Upgrade rocket went smoothly. But the latest launch – the first with a heavy telecommunications satellite intended for geostationary orbit – faced three last-minute launch cancellations and one launch abort before a successful liftoff on March 4. Shotwell said the learning curve at the SpaceX launch installation – the ground system, not the rocket – was steep as the company negotiated the transfer of supercooled liquid oxygen (LOX) to the vehicle. Chilling results in a denser, slush-like fuel that takes less volume than conventional cryogenic oxygen, allowing SpaceX to load more of it and generate the power and speed necessary for geostationary-orbit satellites. "We identified problems with our chilled LOX," Shotwell . "For Orbcomm we did not have these problems. We were actually using a different LOX tank. And then we added additional tanks for extra capacity [for the latest mission]. We didn't overcome it for the first two attempts so we switched back to the original tank that we used for Orbcomm. Then we had to wait for a boat on the third attempt, there was a boat in the way. And then the fourth attempt was upper-level winds. "We got it off on attempt number five. So we had five attempts in eight days. And there's no question but that the LOX issue, while painful for SES, was a kind of minor thing and it's definitely behind us. Shotwell said SpaceX's does not need to start use of Launch Complex 39A at the Cape Canaveral Air Force Station, Florida, spaceport to help work through its backlog. That launch pad will be used for the Falcon Heavy rocket, however. "We don't need to have Pad 39A operational this year to get caught up on the manifest," Shotwell said. "But I do think we are probably going to launch a Falcon 9 before we do the Falcon Heavy in November. SES actually wants to fly from 39A so we are going to see if we can get that ready for SES-10 and maybe SES-11." The SES-10 and SES-11 commercial telecommunications satellites, owned by SES, are scheduled for launch late this year.